I've chosen this as Number 1 as I think it's just so important to take a break from the internet sometimes. Since 2016 began I've been doing this a lot more. I'm not on twitter as much as I used to be and I just feel so much better for it. I spend a lot of my life just looking at screens thanks to my job and my passion for blogging and it does result in a lot of headaches so I have decided to give myself a few breaks this year each day to just relax. I also find putting your phone on airplane mode is an excellent way to just relax and not have anything come through as you're trying to relax and just take in more of what's around you. I'm not the slimmest of people and I definitely feel a lot more tired and groggy lately so one of the things I'm going to do is definitely be more active this year. I'm going on holiday where I'm going to try and be as active as possible. I'll be in a place where I can run and swim and just have an amazing time whilst still being healthy. When I'm back home I'm going to join closes that will motivate me and force me to go to the gym a lot more. I just think being healthy and exercising a lot more will help me feel more energized, happier, healthier and a lot less tired and grumpy as well. I've already been doing this a lot this year. I always tend to turn to sweet drinks or concentrated juices and I've realised that this has been a massive cause of all my weight gain lately. I've realised that water just helps me feel a lot more refreshed and it's improving the clarity of my skin as well. Water can also help digestion as well so this is something I'll definitely be improving on this year. This is something I've actually begun to do. I've always been one of those people who has let people walk all over me and never really let people bring out the best in me and I've realised that this is not the way to live my life. I deserve to be happy and surrounded by people who like to see me happy rather than bringing me down. I had a few toxic friendships and relationships and I've made a pact with myself this year to not let anybody ever make me feel the way I felt in certain situations last year. Yeah, definitely not writing this post at like 2AM because I can't sleep. Oops. But on a more serious note I definitely have to get more sleep this year. It'll mean spending less time online and less time getting stressed out about little things that prevent me from sleeping. I'll be exercising more to use up my energy and force myself to become tired. I have suffered with insomnia for a number of years now and it's getting to that stage now where I have to stop being so lazy and just become a more energetic person. It'll make me feel loads better as well. I know loads of people like this and I think just doing more and having less lazy days will definitely improve how tired you get and will make you want to get more sleep. Don't worry, I'm not going become diet crazy and start cutting out loads of foods I love all for the sake of dropping a couple of dress sizes. I definitely need to lose weight and I know that's the goal for a lot of you out there as well however everything in moderation mixed with some exercise is the best way to go. Don't go on any of these juice diets or crash diets. They aren't good for you and will just make you ill. If they have worked for you in the past then great but I personally just wouldn't recommend it. Just remember as well that cheat days are okay too. Never feel guilty for having a fizzy drink instead of water or a slice of cake instead of an apple. We are human and hey who doesn't love cake?! When I was younger I used to write in my diary things I hated about myself. What was wrong with me? Instead now I've started to write down things about myself I'm proud of like accomplishments or even getting that winged eyeliner just right. When you read it back it will make you feel so much better. I read so many tweets and things saying some girls think they are so great and some girls just have too much confidence and to be honest it makes me so angry. So what if a girl is confident with how great her bum looks in her new dress? Confidence is definitely something that makes us beautiful and attractive. There's nothing wrong with bigging yourself up now and again and saying do you know what? I am pretty great! Do it more often and you'll start believing it. If there's one thing I love it's spending time with me myself and I! Yes I am aware of how cringy that sounds but it is so true. I just love spending hours in my room watching a film, listening to music and blogging or even just pampering myself a bit. I believe it's so important to spend time just relaxing and pampering yourself and spending time alone. It's very relaxing and therapeutic and is the perfect way to just chill out and wind down especially at the end of a long day or long week. Something I think a lot of us, including me have to do is stop complaining about what we don't have and start being more grateful about the things we do have. I spent too much of 2015 wishing for things I know I'll get eventually instead of focusing on the things I do have already and I believe that is something we all definitely need to change. Especially with all that has happened in the world lately. 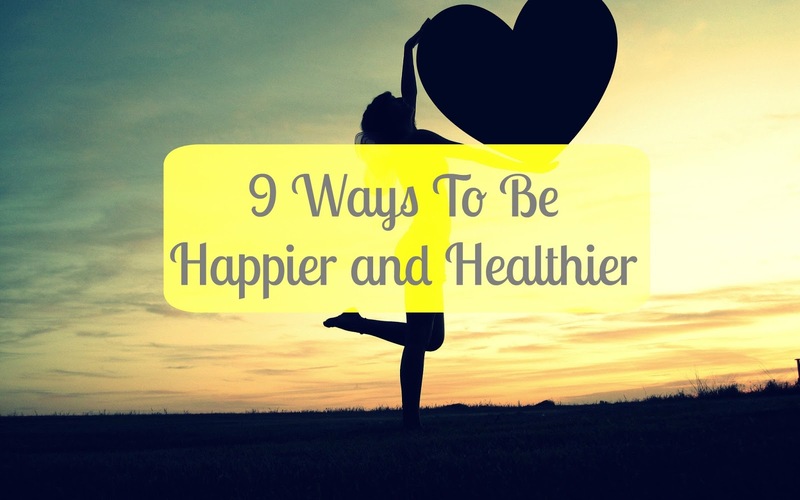 So there we have it, just 9 ways I will be happier and healthier in 2016. I desperately need to make certain changes in my life so this is a little note to myself as well as to all of you who may be wanting to do the same things so I hope this post helped and maybe gave you ideas as well. Please let me know any other little ways you are trying to be happier and healthier in 2016. Here's to a new happier, healthier you! I love this post! There are so many little things that can be done to improve personal happiness and I agree with all the points you made here. These are amazing and such helpful tips I ahve to keep in mind to improve my body and mind! This year is my year to improve and become a stronger person not only mentally but also physically! Thanks for the tips! I'm going to save this page to my favourites somewhere- in fact I think I'm going to send links around some of my close friends. We all need to think about how we live our lives, and how it can make us feel terrible, rather than boosting us up. Definitely think I'm up for a social media break.